In case of multiple outlets, transfer of productions are done between the outlets. The transferred productions are stated as "In House" and the received productions are stated as "External". Transfer of produced recipes to different outlets are done in this page. Note: A production has to be entered before making a transfer. Click TRANSFER RECIPE button to transfer recipes as shown below. 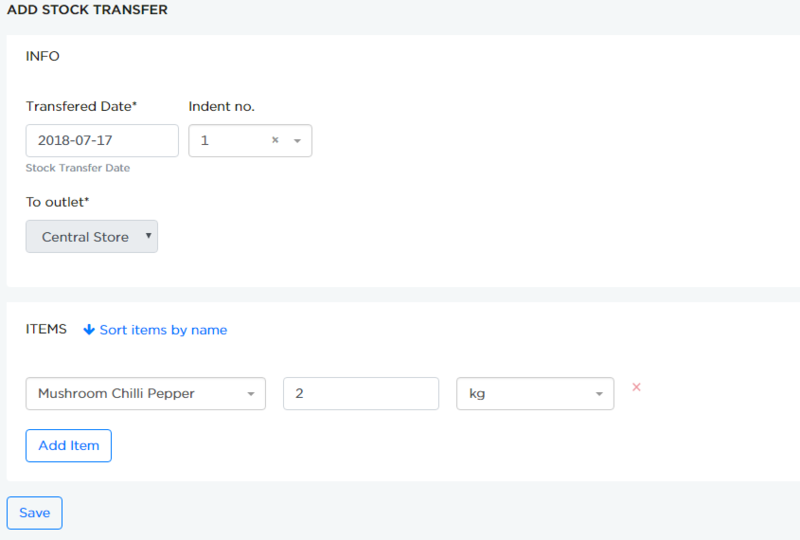 Click ADD RECIPE STOCK TRANSFER dropdown and select the outlet to which the transfer has to be done. Enter the date, indent number and recipes. Click Save to save the transfer details.